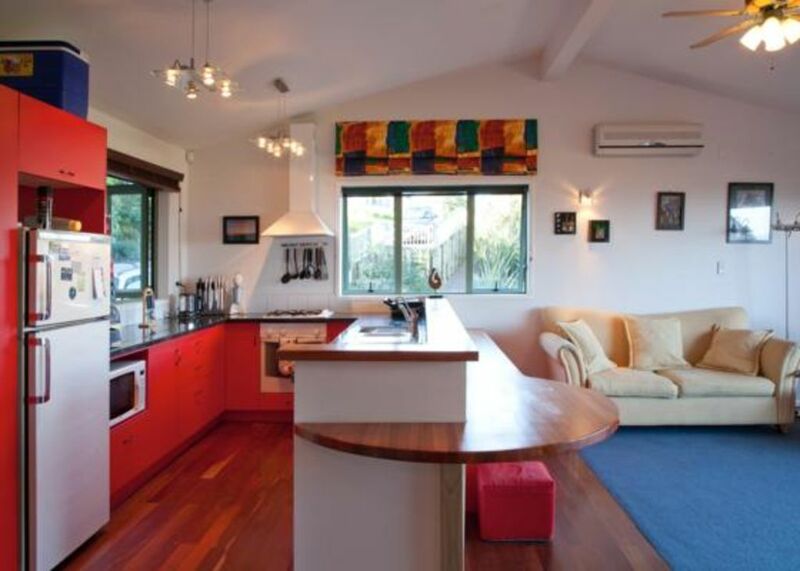 Centrally positioned to island conveniences and a short walk to Palm Beach, Kereru Hill is an ideal choice for a family getaway to Waiheke Island. This very cozy holiday home has all the modern conveniences including two bedrooms with queen beds, a third with three single beds and a pull-out-bed in the lounge. The kitchen has a wonderful granite bench with a cappucino machine, milk shake maker, toasted sandwhich maker and much more. On the deck there is a swinging couch to sit on to wind down and enjoy the beautiful views, piece and tranquility. Beautiful outlook over farmland and the bay. Great views, short walk to the beach- about 20 minutes. Great views, short walk to the beach- about 20 minutes. Good layout but will benefit from bigger size dining table. Very good place to stay. Kereru Hill, was a lovely house, really warm and cosy over a winter's weekend, wonderful view from the sitting room and deck, lots of room for 7 adults, would recommend to others. Great house, beautiful views, 20min walk from Palm Beach. Great location with amazing views. Great location with amazing views. Everything was available to make the stay very comfortable. Absolutely stunning property and bach! Beautiful views, very spacious and homely. Absolutely stunning property and bach! Beautiful views, very spacious and homely. Had everything we needed - even had a dryer and an iron for us to use before the wedding we were off to! Great place - clean and tidy, same as pictures. Great place - clean and tidy, same as pictures. Great toys for our kids too.